The main premise of this work is to deal with the question of boycott, can an artwork boycott? And can we take what the artwork is trying to say seriously? Creating a situation in which the artwork demands the boycott of the institution it doesn’t want to be exhibited, owned, or collected at. The artwork produced is a photograph (79.2x120cm) which contains the contract that has been developed with Dr. Martin Heller, a lawyer based in berlin who is specialist in art related issues. The contract produced, although it is written in full legal terms and language, fails to stand when it is presented in a legal context, its failure comes from the fact that the artwork can’t speak in front of law, it can’t be part of the contract, it can’t speak for it self, the artist can only speak for it, and therefore, this contract produced fails to represent the artwork itself. A kind of a legal and ethical loophole this contract produces. The project aims to investigate the borderline between law and justice, how justice can’t speak though law, and how law becomes a language that includes and excludes subjects according to the law’s regulations and structures. 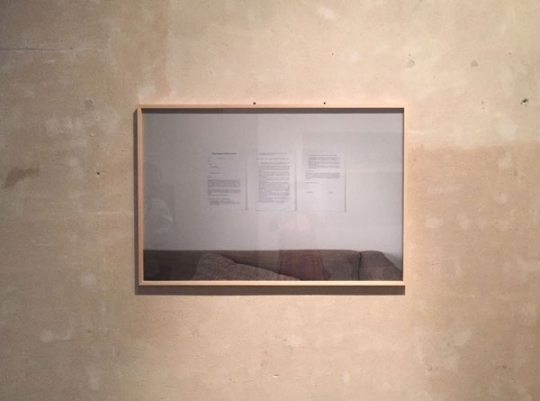 The photograph produced contains the contract that the artwork speaks through, in which it has clear demands about how it can be exhibited, collected, and owned. But whoever exhibits, collects, or owns this artwork can decide whether to obey to these demands and conditions depending on whether they take the artwork seriously.